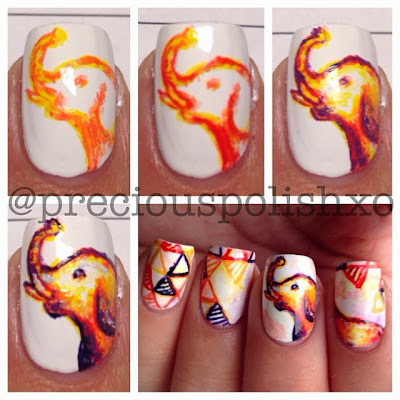 Today's nail art features a baby elephant in a yellow-orange-red-purple colour scheme. The whole thing was inspired by those African sunset photos. You know the ones with the blazing red sky and the profiles of blackened animal silhouettes on the horizon? I drew a lot of inspiration from that but tried to change it up at the same time. The triangles are a favourite pattern of mine, but I painted them on top of a subtle watercolour base for added interest, instead of my usual solid white. Here's the step-by-step for the elephant. As usual I started with the lighter colours first and worked my way down to the darker ones. I wish I could have used a little more red but I found it hard to incorporate. Also I wasn't sure about how to emulate the texture of elephant skin, so I find the painting to be a bit flat. I thought it would be easy because it wasn't fur, but I guess not! I started with a base of American Apparel T-Shirt. I used a small nail art brush to paint the elephant using, in order: American Apparel Sunshine State, American Apparel Sunset Blvd, American Apparel Poppy, American Apparel Dynasty, and American Apparel Imperial Purple. I then did the water colour base (slightly counter-intuitive, I know) using nail polish remover and American Apparel Sunshine State, American Apparel French Lilac, and American Apparel Sunset Blvd. Again I used a small nail art brush for the triangles using the same colours that I used for the elephant, except with American Apparel Manila, a slightly darker yellow. Moving back to the nail art, I was a little worried that the unicorn motif would read slightly too juvenile for a university student. I added 'realistic' florals on the bottom portion of my remaining nails to try to tone everything down. I think it helped out the situation, and I actually really like the florals on their own, especially the ones on my ring finger. I used a combination of roses, gardenias, lilacs, and hydrangeas for reference. Here is a series of progress photos that I took while painting the unicorn. I used a warm base of pastel yellow and pink, gradually adding cooler tones to shade. As you can see in the last step, I found that the jaw was way too skinny, so I simply painted over it and widened it out. Things change quite a bit while I'm working, but luckily I find that this style of painting is pretty forgiving and relatively easy to alter. I started with a base of American Apparel T-Shirt. I used the same order of colours for all of the major components: China Glaze Lemon Fizz, American Apparel Coney Island, American Apparel Flamingo, American Apparel French Lilac, American Apparel Santorini, American Apparel Violet Panache, and American Apparel Imperial Purple. For the gold details I used American Apparel Gold Flash. I know this is a little different from the norm, but I hope some aspects of this manicure appeal to everyone! 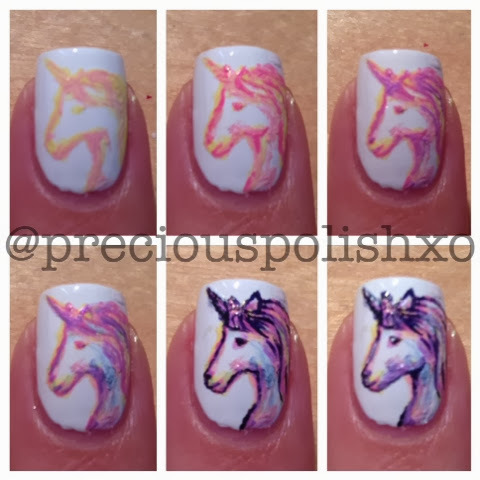 Unicorn enthusiast or floral lover, I hope you enjoyed this nail art! See you next time! Happy Monday, everyone! Here's to the start of a great work week, and a wonderful first official day of autumn as well! I know most people are sad to say goodbye to summer, but personally, I'm more than ready to embrace cozy knits, boots, and tights. I love the changing hues of leaves melting into sunsets, or contrasting against a bright blue sky before colouring the ground. I drew inspiration from these golden browns and purple shadows to create today's nail art. After not being too particularly happy with tiger nail art, I tried my luck at another furry, majestic creature: the lion. 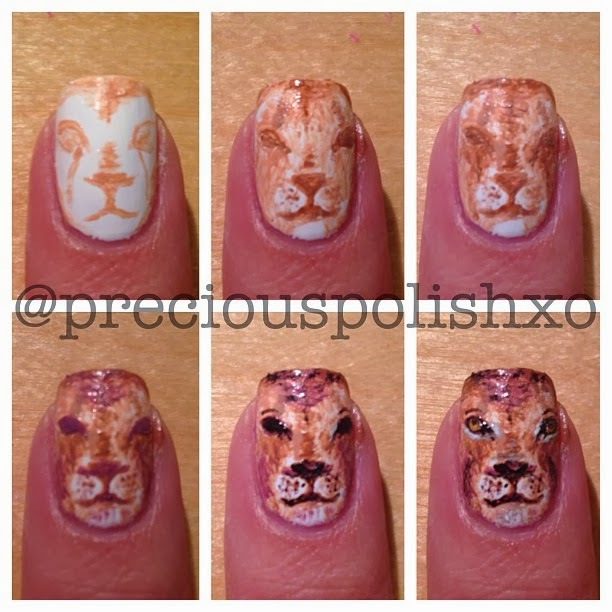 When I started planning out this nail art I wasn't sure if I should paint the lion's face -and- mane on one nail. I settled on keeping the face as the central focus, with the mane on the adjacent nails. I was unsure if everything would align properly for photos, but I think it worked out quite nicely! I kept it simple for the rest of the nails with branches and small bits of greenery. I like the white background behind the design, as I think it adds a nice bit of contrast. As always, here are the progress shots of the lion's face. For reference, this one nail took about an hour to paint. I always find fur the hardest texture to emulate, but I think I'm getting better. I think my technique is also becoming pretty solid and consistent now. I work mostly on just building shadows until everything is distinct. I started with a base of American Apparel T-Shirt on all of my nails. Following the progress photo, I started painting the lion with a small paint brush and American Apparel Palm Springs. I continued to add detail and shadow with American Apparel Makeup, American Apparel Dynasty, and American Apparel Raccoon. I then added highlights with American Apparel T-Shirt, American Apparel California Trooper, and American Apparel Manila. For the branches I used the same colours, and the leaves were done in American Apparel Army Jacket, followed by American Apparel Hunter. I'll leave you with a closeup shot of the finished look. Thank you so much for reading, and feel free to leave any suggestions for more animal nails! 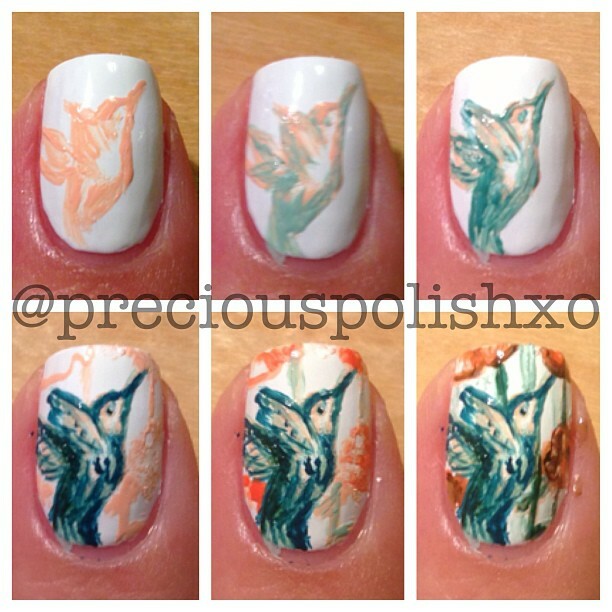 For this nail art I decided to paint some more birds. This time I went for hummingbirds in teal with a peach/orange underlying base. I then added some orange/brown florals for contrast. Overall I'm pretty happy with the look, but I wish I did a little more research for the hummingbirds. I felt like I made them up as I went along, and so they're not as hummingbird-esque as I would have liked. Here's a step-by-step for one of the hummingbirds that I posted on Instagram. I'm really enjoying playing with strange colour combinations, can you tell? :) For these nails I started with a base of American Apparel T-Shirt. I used a small paint brush to paint the hummingbirds with these colours: American Apparel Summer Peach, American Apparel Office, American Apparel Malibu Green, American Apparel Peacock, and American Apparel Hunter. For the flowers I started with American Apparel Summer Peach, followed by American Apparel Sunset Blvd, American Apparel Makeup, and American Apparel Raccoon. I hope you have an easy rest of the work week! As always, thank you for reading and for your kind thoughts! Hi all! If you follow me on Instagram, you'll know that I promised a blog post with these nails on Sunday night. It is now Tuesday, and I am still struggling between breaks to put together this post. Sunday evening was instead spent prepping for lectures because I started my second year of university yesterday. The long hours and commute hit me like a ton of bricks, and left me completely drained. This is unfortunate because I've been dying to share these with you, since I'm really pleased with the way they turned out. I had the idea of owl nail art in my head for the last few weeks, and I kept wanting to pair it with an unnatural but pretty colour scheme and an intricate tribal print. I was browsing Pinterest and found some great inspiration for the owl itself, colours, and patterns. I opted out on the print for something more bold and geometric, resulting in these tribal-esque chevrons. I realized that my fine line work has gotten pretty rusty, so I'll definitely have to start practicing again! I posted a step-by-step for the owl on Instagram, but I'll also include it here to save you the trouble. I painted the owl starting with a mint base, gradually adding darker shades of purple to define it. I think this is one of my favourite animals that I've painted. I'm particularly proud of the eye area, and I think I got the feathery texture down alright. Fur is definitely still a struggle, but feathers are alright, and I'm looking forward to painting more birds in the near future. I started with a base of American Apparel T-Shirt on all of my nails. For the owl I used a small paint brush and American Apparel Office. I added detail with American Apparel French Lilac, American Apparel Dynasty, and American Apparel Imperial Purple. For the rest of my nails I painted the lilac and mint shapes first, followed by the dark purple to outline everything. I hope that those of you starting school aren't finding it too tough just yet. Hang in there, and thanks for reading! I've been itching to paint Keith Haring-inspired nail art for awhile, but I was a little hesitant to work with such a bold assortment of colour. The apprehension lingered as I started working on these, but the black outlines really brought the figures to life near the end. I'm really happy with the finished nail art, so now I'm wishing I had just done them sooner! Haring's dancing figures may not have faces, but to me they express so much joy, energy, and life. I started with a base of American Apparel T-Shirt. I then used a small brush to paint the figures with American Apparel Parakeet, American Apparel Sunshine State, American Apparel Poppy, China Glaze Dance Baby, and OPI No Room for the Blues. I used American Apparel Hassid to outline the figures and add the remaining details. I hope this fun nail art brightened your day! Thank you so much for your readership, and I'll see you soon! Hello! August is drawing to a close, and even though the summer season lingers well past September, I can't help but feel like the first signs of autumn will arrive any day now. The weather this summer hasn't been the greatest, but I'm ready to embrace the consistency of fall sweater weather. To welcome the new season I decided to try my hand at another set of Alphonse Mucha-inspired nail art. I previously painted Summer, so I thought it was only fitting that I continue the series. Today's piece is 'The Seasons: Autumn' from 1896. 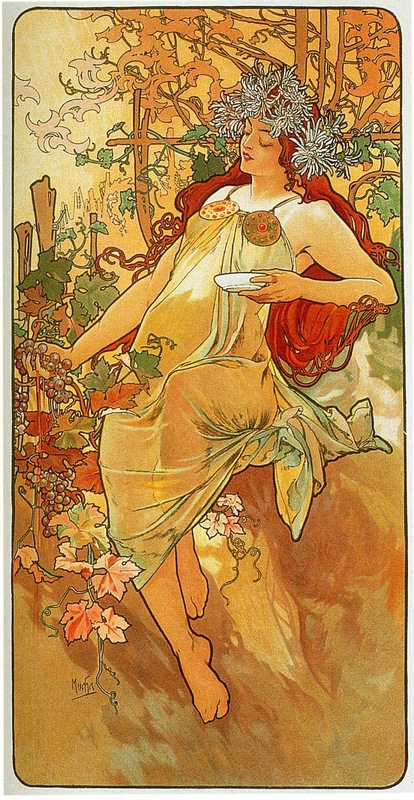 While Summer's pose was lazy and serene, Autumn had a very nice sense of movement to it. I tried to be consistent with the two recreations by painting the female figure on my ring finger, a closeup of her flower crown on my index, and other important background components on the rest of my nails. The most difficult part about this piece were the colours. The blue sky of Summer offered a nice contrast with all of the peach and red tones, but Autumn's colour palette used a lot of similar green and brown shades. I loved all of the leafy and wooden components of the piece, but it was extremely difficult to translate them onto nails without everything looking muddy and indistinct. I wish I had used less brown and more of the green and red tones instead. I'm also not 100% happy with the face, so I'll definitely add that as something to practice in the future. I relied on my trusty American Apparel cremes to paint these with a small nail art brush. The shades I used are: T-Shirt, Summer Peach, Palm Springs, Mannequin, Port, Rose Bowl, Poppy, California Trooper, MacArthur Park, Army Jacket, Hunter, Raccoon, Lopez Canyon, Office, and Sunshine State. You can check out my Instagram for a step-by-step progress photo of how I painted the female figure! Thanks for reading and have a great weekend! If you're interested, I posted this step-by-step image yesterday on Instagram for how to do these florals. I think the watercolour base is what really makes this manicure. It adds a lot of extra interest and colour while still remaining soft and subtle. The florals themselves were done primarily using the remaining two American Apparel shades from the new summer release. I hope to swatch those soon, but I'm just waiting for my nails to grow out a bit. I started with a base of American Apparel T-Shirt on all of my nails except my ring finger, where I used American Apparel Santorini. For the watercolour base I added drops of American Apparel Santorini, American Apparel Summer Peach, and American Apparel T-Shirt, then diluted them with a brush dipped in acetone. I used a small brush and American Apparel Santorini to start painting the flower petals. Then I shaded and added stems and leaves with American Apparel Lazuli. I finished it off by highlighting with American Apparel Summer Peach, followed by American Apparel T-Shirt. As always, thank you for reading and have a great rest of the weekend! Hello! Today I'm trying my hand at some swatching with a few of the new American Apparel nail polish shades for summer 2013. I loved these colours the moment I saw them, and since I haven't seen any swatches of them online, I thought I'd do some for you. There are two blue shades that were released as well, and I plan on purchasing and swatching those at a later time. For now we'll start with these three colours, as well as some matching flamingo nail art! All of the photos were taken indoors with natural sunlight, and I did not use a base coat or top coat. Keep reading after the jump for more photos and detailed reviews. This is also the same design that I am offering in my Instagram giveaway, so go enter if you would like to have these nails for yourself! That's all for today, so have a great weekend! Hello! Lately there are certain things that I really enjoy painting on my nails. Generally, I like nature themes. More specifically, I like animals. And even more specifically, sea creatures! If it inhabits the ocean, I dig it. Sea creatures are always the coolest animals with the most bizarre yet fascinating qualities. Since this week is Shark Week, I utilized the opportunity to paint another underwater friend. To be honest, I would probably cry if I ever encountered a shark, but behind the safety of my TV screen they're pretty awesome. My original plan was to use red and cyan as the main colours to mimic an old-school 3D effect. Like always, things changed, so I started with a peachy base and gradually added darker blues, and then some deep blood red. You can see the progress in this Instagram photo. The mix of colours is definitely interesting and something that I would like to try again. I also really like the way the water turned out. I like the morbid mix of red with the blues and the watercolour look of it. I started with a base of American Apparel T-Shirt. For the shark I used a small paintbrush and outlined with American Apparel Summer Peach, starting to shade with American Apparel Sunset Blvd. I continued shading with American Apparel American Denim, American Apparel The Valley, American Apparel Passport Blue, and American Apparel Port. For the water I outlined with American Apparel American Denim, shading with American Apparel The Valley, American Apparel Passport Blue, and American Apparel Port. Then I highlighted with American Apparel T-Shirt and American Apparel Summer Peach. 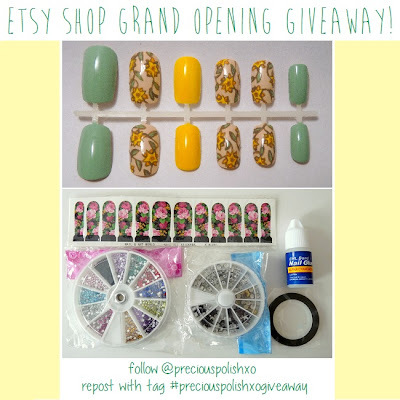 Etsy Shop Grand Opening + Giveaway! Hi all! I'm super excited to announce that my Etsy shop is officially open! Click the banner below to see it! I'm selling hand-painted false nail sets. If you've ever wanted some of my nail art on your nails, this is the best way to do it! I'll be painting more designs in the future, and I'm also doing custom orders. To celebrate, I'm having a giveaway on Instagram! Click the image below to be taken to the post with all of the rules and prize info. Check out the designs that are currently for sale after the jump! Today's design is a peach-orange-purple mix. I wanted to paint some more animals so I settled on this goldfish-like pair. I posted a progress shot of the fish on Instagram last night. I'm really pleased with the way they turned out. I was initially unsure of the way the colours would blend, but everything worked out nicely. I like that each colour looks like a separate layer that builds up to the completed image. I paired the fish with this sketchy triangle print. I really like the diagonal lines as a fill for the triangles. It feels very light and summery, and almost nostalgic and vintage, instead of a bolder solid-colour fill. Overall I really enjoyed painting this manicure. The pairing of the print with the fish is kind of unconventional, but I dig it! I started with American Apparel T-Shirt on all of my nails. For the fish I used a small brush and American Apparel Summer Peach to silhouette the fish and add basic shading. I built upon that with American Apparel Sunset Blvd, and further with American Apparel Violet Panache and American Apparel Imperial Purple. For the triangles I used the same brush, and started from the cuticle, working my way up to the free edge. I'm happy with most parts of the wolf itself. I particularly like the nose/mouth area, but I'm a little irked by the eyes. I don't think I aligned them properly and they look cross-eyed to me. The wolf took awhile to paint so I had to paint something easier on the rest of the nails. I went with the pastel colours because I used those to paint the wolf, but I really wish I had gone for a grey/taupe palette instead. I started with American Apparel T-Shirt on all of my nails. I used a striping brush and American Apparel Office and American Apparel L'Esprit. The square studs are from Born Pretty Store. I used a small detail brush to paint the wolf, starting with lighter colours and building up the darker ones on top. The additional colours I used are American Apparel Dynasty, American Apparel Echo Park, American Apparel Hassid, and OPI You Don't Know Jacques. Thanks for looking and have a good day!